This is the time when you will find many people busy baking cookies for the coming Chinese New Year, which falls on January 23rd this year. I remember how I would always look forward to CNY, when all the shops would be filled with mountains of festive goodies on display, with traditional Chinese new year music blaring from the speakers. The atmosphere is simply fantastic! In Singapore and Malaysia, you will find throngs of people at the shops and supermarkets busy stocking up on CNY snacks, drinks and other food. Almost every store will have some sort of hongbao lucky dip/draw. The clothing section at the department stores will be filled with a sea of red, as it is an auspicious colour this period and most people will try to wear something red on new year's day (although I sometimes get away with wearing pink or purple, or perhaps just a splash or speck of red somewhere). I do miss celebrating CNY back home. There just isn't much of an atmosphere here in Sydney, unless I make a trip to Chinatown where they usually hold a CNY festival including parades, markets and dragon boat races. We've never been to one, so we might just check that one out this year. Anyway, back to baking. 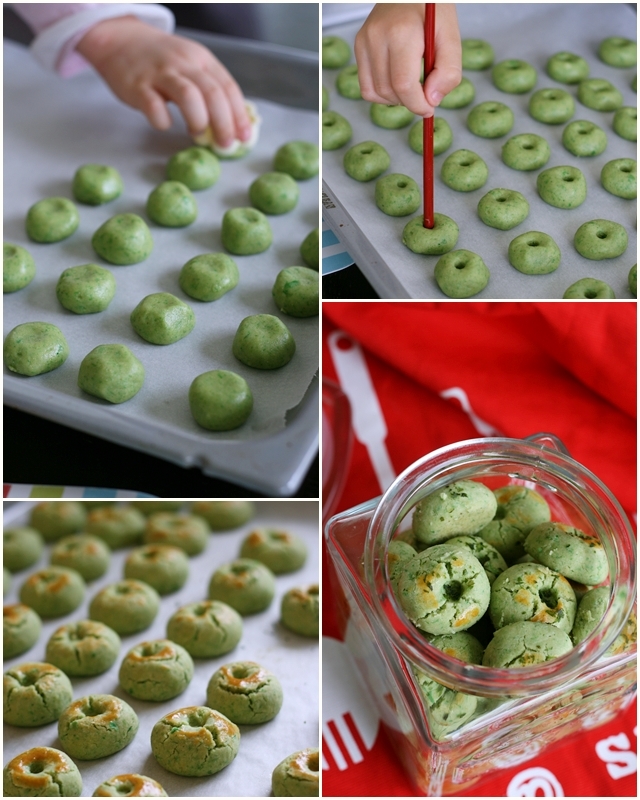 So, I was talking about cookies, and one of my favourite CNY cookies (amongst many others) are green pea cookies. Mind you, they are are different from green bean cookies. These are made from finely ground deep-fried green peas, mixed with flour, sugar and oil, and then moulded into little round balls to form these delicious and fragrant little melt-in-your-mouth cookies. I usually get my sister to bring some back for me whenever she goes back to Malaysia for CNY, but because they are so delicate and fragile, by the time they made their way to Sydney, they would be partially broken and crushed. Well, not anymore, now that I can make my own green pea cookies and enjoy them freshly baked! I used pre-packed commercially ground green peas ( which I got my mum to bring over when she came to visit), but you can also buy deep-fried green peas (you should be able to find them in the dried fruit and nuts section) and grind them yourself. This recipe makes one tray of cookies, which may seem like a pretty small batch, but since they are quick and easy to make, you can easily bake a new batch when needed. That way, you can enjoy fresh cookies every time. I decided to sprinkle some aonori (which is the dried green seaweed flakes that is usually sprinkled on Japanese okonomiyaki and yakisoba) on the green pea cookies, just to give them a little savoury and umami taste. I remember how I used to love these Meiji Animal Crackers that were covered with green specks of seaweed, and thought that the aonori would go well with green pea cookies too. These cookies are not too sweet, not too hard, with just the right amount of saltiness to bring out the flavour of the green peas. Combine the dry ingredients in a bowl and mix well with a hand whisk. Gradually mix in the oil and knead with your hands until the dough feels just moist and comes together without falling apart into crumbs. Add more oil if necessary, but not too much as the dough will be too soft to work with later. Pinch off the dough with your fingers and mould them with your hands to form little balls about 3/4 inch diameter. Place on the baking tray and lightly press down on it with your finger to create a flat top. Alternatively, you could use a chopstick and make a depression in the centre. Repeat with the rest of the dough, and then brush the tops with eggwash. Bake in the oven for 13-15 minutes. Remove and let them cool on the tray. If desired, sprinkle with aonori while cookies are still hot. Store the cookies in airtight containers. This is so pretty especially the first picture. I've never baked anything with green pea flour before. Just wonder what's the taste like? I bet it must be yummy and healthy cookies, won't you agree? And, beautiful photos you have taken. I always love to view all your beautiful photos! These are absolutely gorgeous! I am sure by baking these, you've filled brought some CNY spirits to the household! I miss CNY back home too. But your gorgeous cookies would add atmosphere to any home! I like this cookie too, your pictures are awesome! I love the bright green colour of these cookies! I'm definitely going to buy that... that is my favourite. These cookies are so pretty in their jade-green colours. I would think these homemade goodies are very auspicious to eat for Chinese New Year.